Published on November 2, 2014 by Martyn. Be the first to comment! 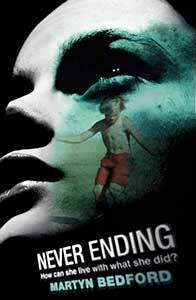 I’m pleased to announce that Never Ending has been shortlisted for the 2015 Essex Book Award. The award, one of the bigger regional prizes for teenage fiction in the UK, is a county-wide scheme aimed at encouraging students aged 11 to 14 to “enjoy wider reading for pleasure, foster a passion for fiction and provoke debate among young people”. Run by the School Library Service, it is open to all secondary schools in Essex, Thurrock and Southend – last year 26 schools took part. Participating schools are encouraged to read the books through reading groups, class work and other events. Students then post their book reviews and comments on a specially dedicated blog. And, of course, the students themselves choose the winning title and vote for their favourite online. It’s the second time I’ve been in contention for the Essex Book Award, after my debut YA novel, Flip, came runner-up in 2012. This year’s shortlist is a formidable line-up, with some of the leading names in teenage fiction. The overall winner will be announced at a special event in Chelmsford in March and I’m hoping to arrange to visit one of the participating schools before then, as I did two years ago, to run some workshops and give a reading.